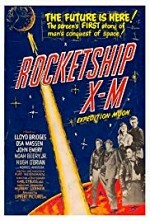 Watch Rocketship X-M: Astronauts (Lloyd Bridges, Osa Massen, John Emery, Noah Beery, Jr., and Hugh O'Brien) blast off to explore the moon. Because of craft malfunction and some fuel calculations, they end up landing on Mars. On Mars, evidence of a once powerful civilization is found. The scientists determine that an atomic war destroyed most of the Martians (who surprisingly look like humans). Those that survived reverted to a caveman-like existence.